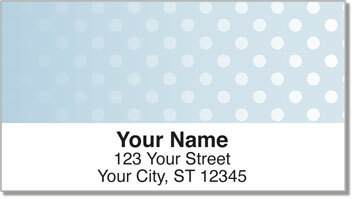 Circular shapes seem to evaporate on this stylish return address label design from CheckAdvantage. But perhaps it depends on your point of view. Are the circles vanishing or appearing? This is a colorful yet professional way to mark your mail before sending it off. Scribbling out your name and address with a pen can leave letters and packages looking messy. But with these convenient labels, you'll always appear polished. The best part about this product is how much time you can save. Since these are self-adhesive labels, all it takes to finish off envelopes is a quick peel and place. Get your own Fading Circle Address Labels now! You can also order a set of matching personal checks.